Fuel economy is a healthy 65.7mpg on most versions with a 0-62mph figure of 11.3 seconds so quick enough for those short city rides. A touchscreen media centre comes as standard as does DAB radio, remote central locking and fold flat seating. The interior is at the usual Volkswagen standard. With plush trim choices and well laid out controls to make the drivers task comfortable at all times. There are 5 trim levels available from S to R-Line. 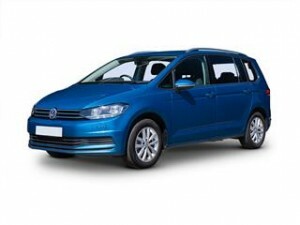 Our no fuss no fee online car offers quotation system could save you money on your new Volkswagen Touran. Once you have built your car with your desired spec we can scour the dealers for the latest offers on your chosen model. The car you desire is then just a phone call away at a price you didn’t expect. There is no fee for our service and we can even help with finance subject to status with many finance plans available, these can be discussed prior to purchase. Simply fill in our online car configure form and we do the rest, you could receive offers today.